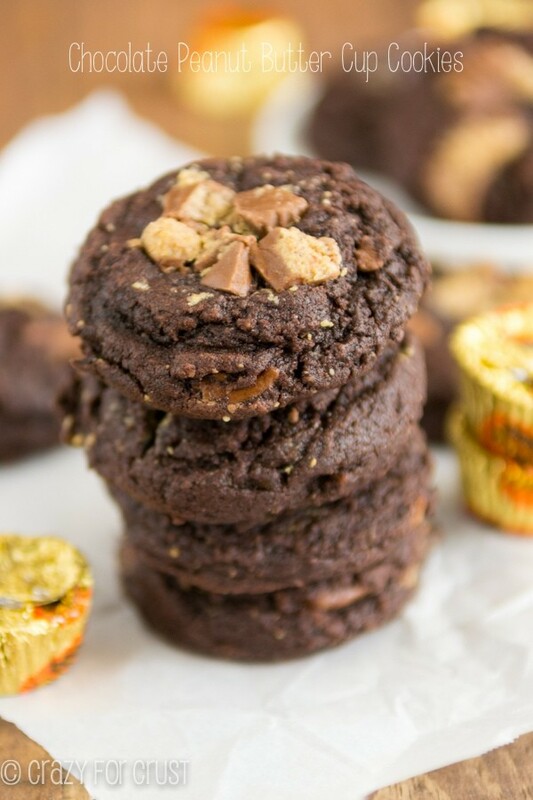 Chocolate Peanut Butter Truffle Cookies are the perfect mix of chocolate and peanut butter. 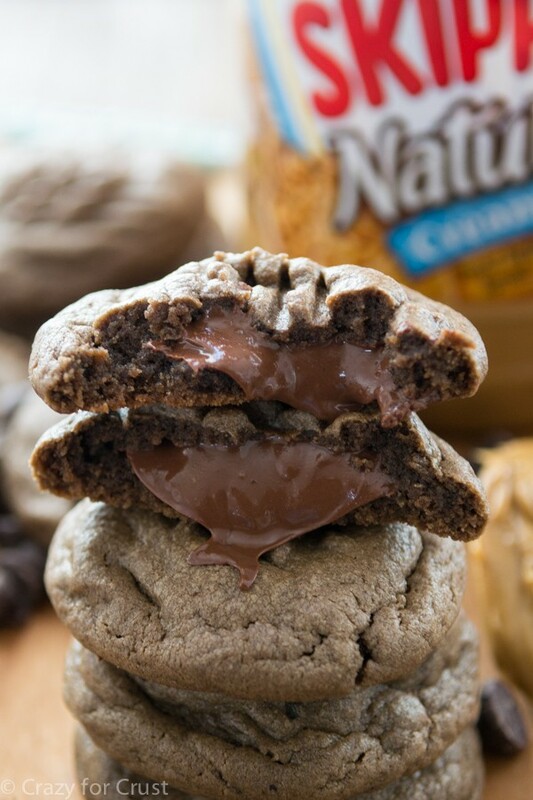 They are filled with a gooey chocolate peanut butter truffle filling. 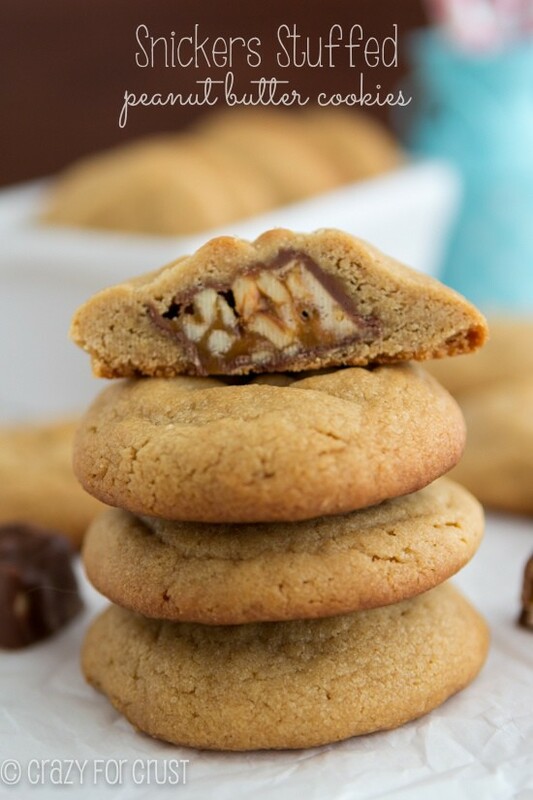 Can you believe it’s been over a month since I shared a peanut butter cookie recipe? That’s, like, a record. To make it up to you, I’m posting something that’s going to blow your mind. Thanks to Skippy Peanut Butter, I’m introducing you to a Chocolate Peanut Butter Truffle Cookie. Yeah. I did that. When I was in high school and college, my mom and I would make tons of Christmas cookies. We’d set up platters all over the dining room table and evenly divide up the fudge and rice krispie treats, the Russian Tea Cakes and the refrigerator cookies, and my personal favorite, the peanut butter blossoms. I remember painstakingly making a double batch of peanut butter blossoms every year, scooping small 1 tablespoon balls of dough, rolling them in sugar, and then planning how many really needed to go on the cookie platters vs. in my tummy. Now, because my mom and I don’t live very close, and because I bake cookies all day every day this time of year, we don’t make our cookie platters together anymore. But peanut butter cookies are always on my to-do list when Christmas comes close. Y’all know my husband is a sucker for a peanut butter cookie and because it’s one of the only desserts he eats, there is always a version in the works this time of year. Enter: these epic chocolate peanut butter cookies. When Skippy asked me to be a part of their holiday YIPPEE campaign this year, I could not decide what I wanted to make. There are just so many good peanut butter cookie recipes out there – how would I choose what my next BIG recipe would be? And then I thought: Chocolate. I have never made a chocolate peanut butter cookie before. I’ve made chocolate cookies and added peanut butter cups, but never filled an actual peanut butter cookie with chocolate. I used my favorite peanut butter cookie recipe for the base of the cookie. And, as usual, I used Skippy Naturals Peanut Butter. SKIPPY has been my brand since I was a little girl, and it’s what I use in every single peanut butter recipe on this blog (and in my book). I reduced the amount of peanut butter in the cookie, so that I could add two kinds of chocolate: melted semi-sweet baking chocolate and dark chocolate cocoa powder. Note: I also made these with regular unsweetened cocoa and I liked them just fine, but I like the dark look of special dark cocoa. So use what you like! The chocolate peanut butter cookie was good. It was fine. But I wanted something MORE, because, well, this is me we’re talking about. I don’t do normal very often. I prefer things like this. Or this. Or this! So instead of just showing you a normal chocolate peanut butter cookie, I stuffed mine with a chocolate peanut butter truffle. Simply put, you melt chocolate chips with peanut butter, then chill the mixture until it’s the consistency of a scoopable truffle. Then you roll the cookie dough around the truffle ball and bake it. When these are warm from the oven you get a gooey chocolate peanut buttery center. Once they completely cool, the center hardens a little and tastes like a soft peanut butter truffle…inside a peanut butter cookie. 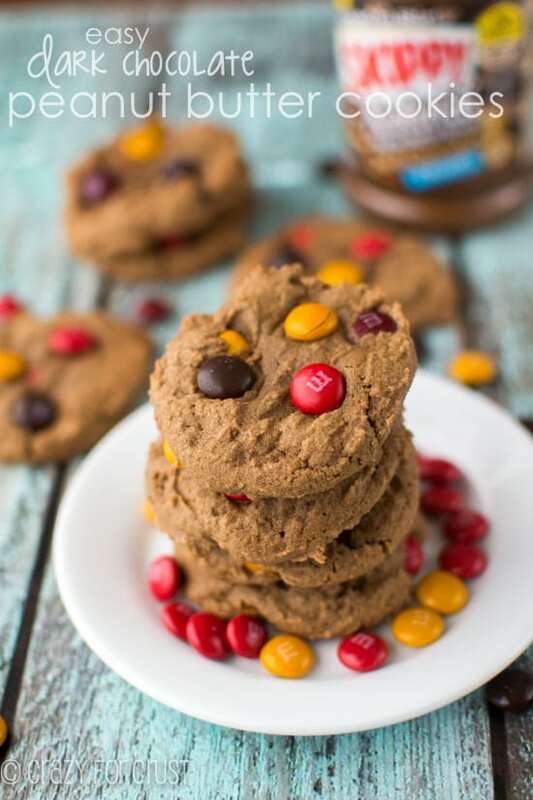 There is no shortage of peanut butter OR chocolate flavor in these Chocolate Peanut Butter Truffle Cookies, that’s for sure! And that’s kind of a good thing. Because peanut butter cookies are required eating at the holidays. They make our holidays fun and enjoyable. 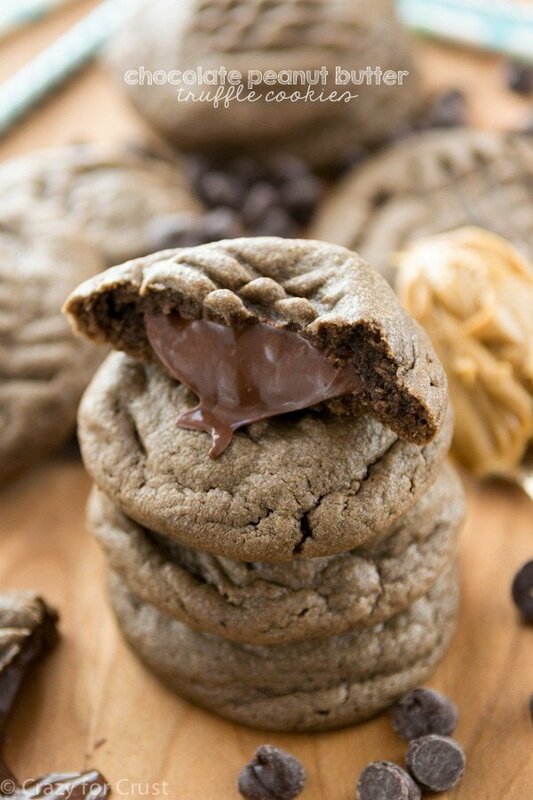 Especially when they ooze gooey chocolate, like theseChocolate Peanut Butter Truffle Cookies will. Am I right??? A chocolate peanut butter cookie that's filled with a chocolate peanut butter truffle mixture, then baked. 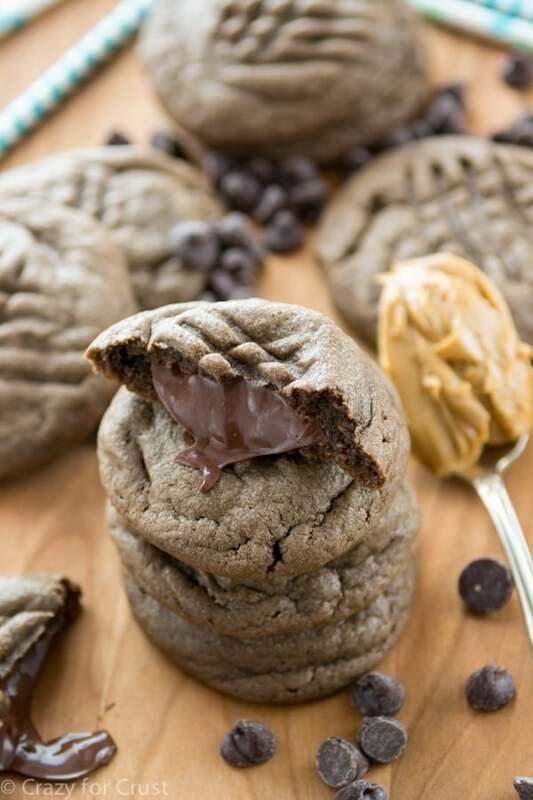 These are gooey, rich, and double the chocolate peanut butter flavor! Cream butter, 1/2 cup peanut butter, and both sugars in the bowl of an electric mixer fitted with the paddle attachment. Slowly mix in melted chocolate. Add egg, vanilla, milk, and salt, cocoa and baking soda. Mix until combined. Slowly add flour and mix until dough comes together. Bake for 8-10 minutes, until they just begin to loose their glossy sheen. I like to under bake them, but if you like a more done cookie, you can bake them the full 10 minutes. Cool completely on cookie sheets. If you eat these within a few hours of baking they’ll be gooey and drippy like the pictures. As the inside cools, it’ll be more like a truffle on the inside of the cookie. Do you want to have a super fun holiday full of Skippy Peanut Butter? You know you do. The holiday baking season is upon us! Enter the #SkippyYIPPEECookies Sweepstakes for a chance to win nutterific peanut butter and supplies for the ultimate peanut butter-filled holiday. Create a new board called #SkippyYIPPEECookies Sweepstakes. Pin three (3) SKIPPY cookie pins from this board to your #SkippyYIPPEECookies Sweepstakes board. Pin at least three (3) other holiday pins (ingredients, holiday themed décor) to your #SkippyYIPPEECookies Sweepstakes board for a total of six (6) pins to complete your perfect YIPPEE holiday. See the official rules here. I’m going to enter too. Follow my SkippyYIPPEECookies board here and get some ideas to repin to your board. 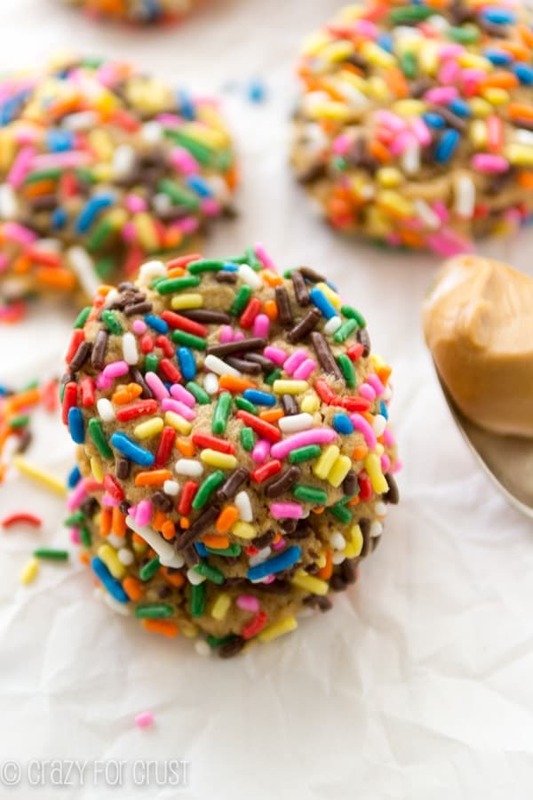 Those look like the best peanut butter cookies ever! I love all the chocolate, and the truffle centre is amazing! I think these cookies are about as perfect as cookies can be! Oh my gosh, these are pure perfection! I need these, right now! In my mouth, Right Now! I may or may not of just licked the screen. 🙂 I want a bite and a lick of that ooey gooey goodness! I love that you baked a pb truffle into a cookie. You’re my hero. My mouth is watering! I love the melty chocolate! Hi!! Quick question!! How much of the chocolate chips is used for the truffles and how much for the cookie mix?? Directions say to add melted chocolate but it’s not specified how much of the 1 cup the recipie calls for is used to create the truffle mix and how much for the batter. Also – for this melted chocolate, do you add peanut butter as well??? Or just melt the chocolate? The chocolate chips are used for the truffles and the baking chocolate is used for the cookies! Enjoy!